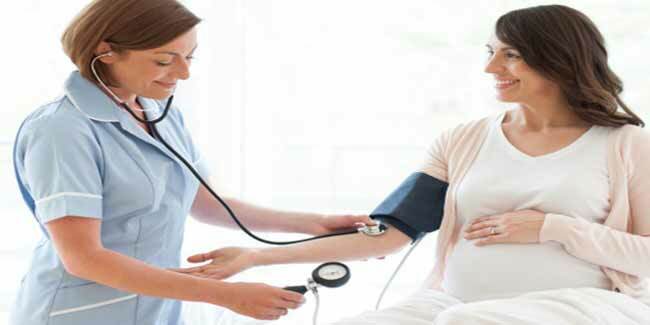 Most pregnant women experience high blood pressure. It usually goes away after delivery. In some cases, it can pose health risks. Contact your doctor if you experience high blood pressure during pregnancy. A woman’s body goes through several physical and emotional changes during pregnancy and some of these changes are less welcome as they may be discomforting or even painful. High blood pressure during pregnancy is one such major change that occurs in some women during pregnancy. Although chances of high blood pressure during pregnancy are high in women, who have had pre-existing high blood pressure, it is quite common in others as well. Usually, hypertension during pregnancy doesn't cause much trouble, but in some cases, it can lead to severe health problems, posing risk to both the developing foetus and mother. The threat posed by hypertension can easily be understood through the fact that it is one of the leading causes of death amongst pregnant women. As you may know that high blood pressure can be problematic in any case, it poses severe risks especially when you are pregnant. You may experience pre-eclampsia after 20 weeks of pregnancy that usually goes away after the delivery. However, it could cause some serious damage to brain, liver and kidneys of the mother. It can also keep the foetus from getting enough oxygen and blood supply. In addition, it could lead to serious seizures in some women called eclampsia. During pregnancy, your health care provider will keep a tab on your blood pressure during regular checkups. If your systolic pressure gets higher than 140 or diastolic pressure goes higher than 90, it will indicate a problem. Pre-eclampsia is not as easy to diagnose as hypertension. Your health care provider will look for signs of protein in the urine if you have high blood pressure to know whether you have eclampsia or not. Your doctor will perform a urine test for the same or a non-stress test to ensure normal heart rate and movement of the fetus. An ultrasound may also be done in order to check health of the fetus. As per the National Heart, Lung and Blood Institute (NHLBI), blood pressure can rise during pregnancy due to several possible reasons. These causes may include unhealthy lifestyle changes, obesity, and lack of physical activity. Experts suggest that women take preventive measures before getting pregnant and during pregnancy to reduce risks of high blood pressure and eclampsia.